Abiolu Nursery and Primary School, a co- educational private institution founded by Engineer and Mrs. Dokunmu took of on the 16th September 2002 with a student population of 21 ranging from preparatory class to primary 4 and staff strength of 6. The physical environment of the school is conducive for learning a prototype building with standard classrooms, a special cool room called sickbay with facilities and first aid materials. A separate room properly ventilated with suitable library furniture, designated book shelves, fan and current recommended text books, large playing ground, well demarcated with concrete block and properly sand filled with playing equipment..
Abiolu School is maintaining an atmosphere of discipline in all ramifications. The teachers are committed and conscientious to their duties their duties. Abiolu is a school like home for children. You can entrust your children to our care. We are up to the task. 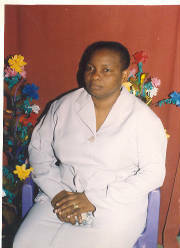 Mrs Dokumu Is the proprietress of Abiolu Nur & Pry School. An academician, and a lover of kids. She is happily married with 3 children. Her vision for the school is to train leaders of tomorrow thereby making them symbols of excellence at home, in the society and the nation at large. Designed By: Royal Place (08023186151) Copyright © Abiolu Nur/Pry School 2004. All Rights Reserved.